Birthplace : Newark, New Jersey,U.S. Sarah Lois VaughaN was an American jazz singer, described by Scott Yanow as having "one of the most wondrous voices of the 20th century." Nicknamed "Sailor" (for her salty speech), "Sassy" and "The Divine One", Sarah Vaughan was a Grammy Award winner. The National Endowment for the Arts bestowed upon her its "highest honor in jazz", the NEA Jazz Masters Award, in 1989. Sarah Vaughan's richly expressive voice has held the jazz world in thrall for more than four decades. Vaughan's recordings and live performances convey a physical delight in singing as well as an artist's sensitivity to the complicated harmonies and rhythms of modern jazz. As Louie Robinson notes in Ebony, however, the "delicious elegance" of Sarah Vaughan "has always been a little too rich for the masses to digest. You can sing along with Mitch Miller, but how in the world do you match the undulating flights of one of the most remarkable voices of the century?" Indeed, Vaughan long ago gave up trying to market herself to a pop audience, opting instead to create a body of work she could be proud to perform. She has thereby earned the highest critical regard, and the appreciation, to quote Robinson, of "those with the ... taste and musical knowledge to appreciate the vocal miracles she performs night after night, year after year." In a down beat magazine profile of Vaughan, composer Gunther Schuller deemed the singer the "greatest vocal artist of the century." Schuller claimed that Vaughan's "is a perfect instrument, attached to a musician of superb instincts, capable of expressing profound human experience, with a wholly original voice." Saturday Review contributor Martin Williams expresses a similar opinion. "Sarah Vaughan is in several respects the jazz singer par excellence," Williams contends, "and therefore she can do things with her voice that a trained singer knows simply must not be done. She can take a note at the top of her range and then bend it or squeeze it; she growls and rattles notes down at the bottom of her range; she can glide her voice over through several notes at mid-range while raising dynamics, or lowering, or simply squeezing." This vocal experimentation meshes perfectly with the improvisational freedom of bebop and jazz. "Only once in each generation come a voice like this," claims Dave Garroway in The Jazz Titans, "one artist who brings a new approach, a new way of communicating the emotions which stir every soul." An only child, Sarah Lois Vaughan was born in Newark, New Jersey, in 1924. Both of her parents enjoyed making music in their spare time--her carpenter father as a guitarist and piano player, her mother as a singer with the local Baptist church choir. Sarah herself joined the choir as soon as she was able, and she took piano and organ lessons from the age of eight. Gospel music was not young Sarah's only passion, however. She has admitted to sneaking into neighborhood bars during her teens to hear jazz played by visiting performers. She also played piano in the jazz band at Newark's Arts High School, where, as she told down beat, she "learned to take music apart and analyze the notes and put it back together again." Vaughan was only eighteen when, on a friend's dare, she entered an amateur contest at Harlem's Apollo Theatre. She won the contest--and a week's engagement at the Apollo--with a jazz rendition of "Body and Soul." Vaughan told down beat that she feels she became famous not because of rigorous training but because she was in the right place at the right time. "I was going to be a hairdresser before I got into show business," she said. "I always wanted to be in show business, and when I got in, I didn't try. I just went to the amateur hour, and in two weeks I was in show business. It shocked me to death and it took me a long time to get over that." Vaughan's week at the Apollo had not run its course before she was discovered by Billy Eckstine, a young singer with the Earl Hines Orchestra. Eckstine persuaded Hines to hire Vaughan, and her career was launched. She had her professional debut April 23, 1943, as a singer and second pianist for Hines. The following year, Billy Eckstine formed his own band, and Vaughan joined him. Eckstine's was one of the first major bebop groups, and through his aegis Vaughan met Dizzy Gillespie and Charlie Parker, two jazz pioneers who were to have great influence on her style. It was Gillespie, in fact, who landed Vaughan her first solo recording contracts with Continental and Musicraft Records. Together Vaughan and Gillespie cut "Lover Man," her first song to receive national attention. Subsequent Vaughan singles "Don't Blame Me" and "I Cover the Waterfront" also attracted favorable review. Vaughan became a solo performer in 1945, and in 1947 she married trumpeter George Treadwell. Under Treadwell's management, Vaughan blossomed from a shy, gap-toothed, awkward young woman into a sophisticated and elegant performer. She began earning top billing at prestigious clubs in Chicago and New York, and by 1950 she was selling an estimated three million records annually. Still, Vaughan had to undergo the same sort of bigotry other black performers faced--inadequate or nonexistent dressing rooms in the white clubs, segregated restaurants, and occasional alley beatings by gangs of hoodlums. She was even pelted with tomatoes once during a performance at a Chicago theatre. Aware that only a small percentage of her audience was hostile, however, Vaughan persisted, constantly experimenting with her vocal range until, as Williams puts it, "fewer and fewer popular songs could contain her." In 1953 Vaughan signed with Mercury Records and embarked on a short but successful pop career. By 1959 she had made the Billboard charts with songs like "C'est la Vie," "Mr. Wonderful," "The Banana Boat Song," "Smooth Operator," and the million-selling "Broken-Hearted Melody." Most singers struggle valiantly for chart-topping hits, but Vaughan did not like the direction her career was taking. "The record companies always wanted me to do something that I didn't want to do," she told down beat. "'Sarah, you don't sell many records,' they'd say, and so Broken Hearted Melody came up. God, I hated it. I did that in the '50s and everybody loves that tune. It's the corniest thing I ever did." Eventually Vaughan decided to follow her own instincts, and, as James Liska notes in down beat, the material to which she lent her talent emerged "with the inimitable Sarah Vaughan stamp clearly on it--a stamp which seems to just happen." Since the mid-1970s Vaughan has earned a comfortable six-figure income from recordings and live shows. She has appeared everywhere from the prestigious Newport Jazz Festival at the Lincoln Center for the Performing Arts to the Las Vegas showrooms, and she has performed privately for several presidents in America and Europe. In his book Jazz People, Dan Morgenstern calls Vaughan "essentially a private person" who "has never been involved in notoriety and has no ... peculiarities." Morgenstern adds: "She might have become a great gospel or classical singer, but it is doubtful that her imagination and inventiveness could have unfolded elsewhere as fully as it has in jazz." Robinson concludes that Vaughan's style "is not one to go with electrified guitars, 8,000 watts of amplification and a lyric which can only be understood if you're reading along on the record jacket.... And there is the heart of the matter. Sarah is not made to be danced to or finger-popped to but to be listened to. That superb contralto voice that ranges over three octaves with the ease of a Maria Callas and the soul of a Harriet Tubman commands a listener's respect." Robinson need not worry. Vaughan has never lacked respectful listeners among those who appreciate innovative work. The singer told down beat that she is grateful for just the sort of quiet popularity that she has achieved. "It's unbelievable, that's what it is, that everybody likes me as well as they do," she said. "I still can't believe it.... I've been singing all my life and I've never really thought about anything else.... But I'm the same way now that I was when I was 18. I don't go for that star stuff.... All the stars are in heaven." -Duke Ellington Song Book One Pablo. -Duke Ellington Song Book Two Pablo. -Echoes of an Era Roulette. -How Long Has This Been Going On? Pablo. -In the Land of Hi-Fi Emarcy. -More from Japan Live Mainstream. -Sarah Vaughan: Volume One Archive of Folk Music. -Sarah Vaughan: Volume Two Archive of Folk Music. -Sarah Vaughan: Volume Three Archive of Folk Music. -Send in the Clowns Pablo. -Time in My Life Mainstream. 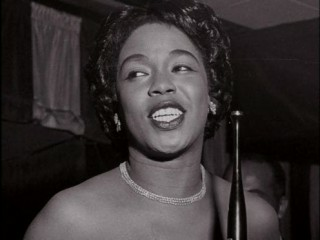 View the full website biography of Sarah Vaughan.